Age tends to have a more obvious effect on the skin than any other body part. Aside from your skin showing signs of aging and wrinkling as you grow older, it will it also get more sensitive, requiring you to take extra measures to care and protect it from harm – which usually comes in the form of the sun’s rays. When you’re a senior, you’ll need to follow the ideal skin care tips that will make your skin look its best, even as more years are added to your life. The tips written below are actually beneficial to individuals of all ages; however, seniors should pay particular attention as these are especially advantageous to them. 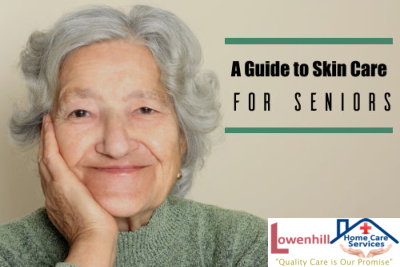 With the assistance of personal care attendants from renowned home care agencies such as Lowenhill Home Care Services, seniors can implement new and improved techniques for skin care into their daily regimens. Like everybody else who is concerned about having and maintaining healthy skin, seniors should eat vitamin-rich foods that contain all kinds of minerals, as well as antioxidants. Such foods include green leafy vegetables, walnuts, avocados, salmon, and much more. A lot of debate has surrounded studies regarding how healthy water actually is for a person to drink each day. Regardless of this, the fact still remains that keeping yourself hydrated is key to gaining a lot of health benefits particularly for the skin. With water, you can flush out all the toxins in your body which may potentially lead to skin problems. A senior’s skin is proven to be so much more sensitive and could potentially sustain more damage from the harsh rays of the sun. Keep your skin healthy by steering clear from tanning beds and lotions. Also make it a point to wear protective clothing and apply quality sunscreen if you plan on staying outdoors for an extended period of time. Smoking is deadly, not only to your skin, but to your health in general. When you smoke, it’ll show on your skin by how dull and dry it feels. Give up smoking so you’ll not only look better, but you’ll become healthier as well! Lowenhill Home Care Services delivers quality skin care services with the help of specially-trained personal care attendants. We endeavor to prevent skin disease and infection in seniors through reliable skin care services. It will keep the skin looking healthy and vibrant even as our clients grow older. Feel free to call us at 724-788-1072 or send an email to barb@lowenhill.com for more on our services. You may also visit our page at www.lowenhill.com.